In order to have Minstrel Cramps one must first suffer from PMS, Pre Minstrel Syndrome. This is the syndrome effecting all little boys and girls who want to grow up to be a minstrel. Sort of the middle ages version of Guitar Hero. For a moment there I thought you were going to suggest that minstrel cramps tend to occur when you reach Middle Age. To begin with, the cartoon is great! Craniac and John, I love your comments. 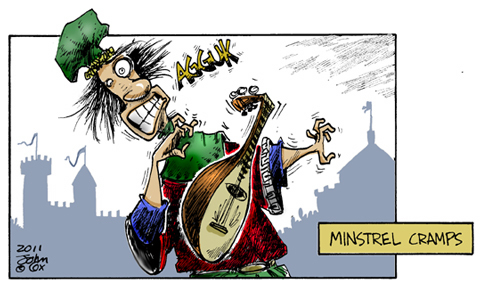 Minstrel Cramps can be cured with a simple Historyectomy. Ya aced it! That is a funny addition. Yikes. Does Sarah Silverman know about this guy? Still. a weird pun deserves a visual, no? Minstrel symptoms are typically most annoying during the luteal phase. Thank goodness there is neither a banjoal nor a bagpipeal phase. Your visual is quite amusing; Sarah's, on the other hand, is just plain disturbing. Ravi Shankar as a minstrel... Hmmm... That sounds like a funny premise for a movie where all of the stereotypes are atypical--or perhaps instantaneously scrambled by some magnificent event. WHY would you go & look at ANYTHING done by Sarah Silverman? It was an internet surfing accident, T. Unfortunately, the image has been burned into my brain. A few years of therapy and heavy drinking may help, but I'm not optimistic. This page contains a single entry from the blog posted on March 12, 2011 4:39 PM. The previous post in this blog was Testing The Waters.